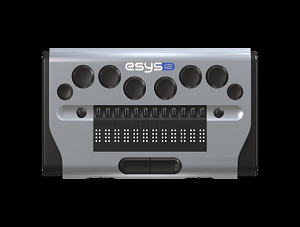 esys 12 is a refreshable 12 cell Braille display with integrated Braille keyboard and navigation keys. 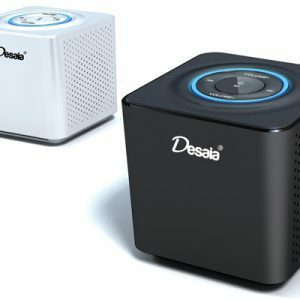 It can be used independently or as part of a PC work station via Bluetooth or USB technology. It is multi functional and has a modern minimal design. It features a slot for micro SD-card to quickly save files on the go. It can also be used to send and read instant messages while keeping your mobile phone or PDA in your pocket or bag! esys 12 features a 10 key Braille keyboard, which allows the possibility to reproduce all standard key combinations, both for typing and navigation, enabling the user to fully navigate the computer Windows application. esys 12 has two joysticks located to the left and right of the Braille line which can be used to easily control Microsoft Windows, or screen reader menus. The lower front navigation wheels are used to faster browse through information. Thanks to esys 12’s efficient battery life it gives you up to 17 hours of autonomy! Notepad: create *.txt, read and edit *.brl or *.brf files. Use basic functions such as “find”, “replace” or ”tag”. Save your document and create an advanced tree folder structure. Use the “read only” function to read a book or larger documents. Agenda: set up and post meetings. Check your planning using a weekly overview, select the date or event you want to edit. Information will be stored in a text file which can be transferred to your PC. Alarm Clock: set up different alarms for each day of the week. additional Braille table or set parameters for the software interface. This menu also assists the user to update to latest firmware version.